This entry was posted on Thursday, February 23rd, 2012 at 21:15 and is filed under Election 2012, Mitt Romney, News, Occupy Wall Street, Politics, RINO Alert, Taxes, video. Just another of literally thousands of examples why this guy should not be the nominee. What a Casper Milk Toast. He is an example of the "wussification" of America. A real man would not appologize for his success. Maybe he is ashamed because his wealth was not legitimately earned. Not ashamed enough to give back the $$, though, I notice. Mr. Romney is the obvious choice of the Cronies for the Republican nomination and the personification of their strategy to win the 2012 election before the Spring Equinox. The strategy is to pick both the Republican & Democratic nominees. 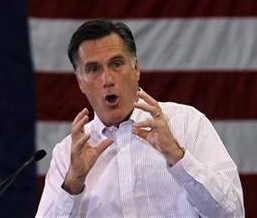 If Mr. Romney wins the Republican nomination the cronies won the 2012 election regardless of the election results. Of course, if Mr. Romney clinches the Republican nomination the puppet press will attack him; just as they did McCain in 2008, even though the winner of such a contest is irrelevant the illusion of a contest must be maintained. Mitts almost as big a spoof on the American citizen as Obama has been.